HIPPIH, a company combined industry and trade as a whole, dedicated to manufacture utility products for consumers at Home, Kitchen, Garden, Household 10 years, expanding to Automotive, Office Products, Electronic in recent years and resonated with people back home. HIPPIH 18 inch pillow inserts, not only great for home decorations, can also be great back cushions when you are tired and perfect throw pillows when are leisure for watching TV on sofa or bed. 1. Hand and Machine washable, it should be totally dry then can be used. 2. Put it under the sun every 3-4 weeks to keep its shape and Fluffy degree. 3. The pillow insert shown on the picture is 3D size. When we deliver it, we will Take out the vacuum and press it. So when you receive it, you need to put it under the sun for one day then can be used. 4. Whether you are using it solely as an accent piece to create interest in your room, or as a functional head pillow, this fashionable bedding accessory offers great looks and endless comfort. 5. This poly-filled pillow provides firm support for your neck as you lie in bed - or back support for when you're in a seated position. After filling, pillow will decrease about 10% - 15% in size. 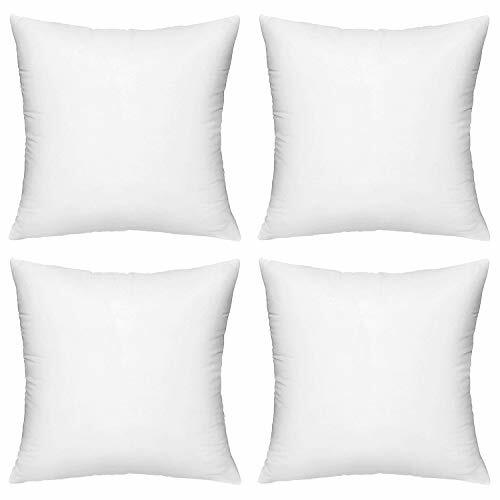 REBOUND EASILY AFTER USE : HIPPIH 18 x 18 pillow insert are made of premium thicken polyester non-woven and highly durable 3D PP cotton, keep full after long use, no worry about pillow inserts' flat thing. CORRECT MEASUREMENT METHOD: HIPPIH pillow inserts measured in 18 x 18 inch. The right way is measuring from one side seam to the another seam by tape. KINDLY REMIND : This insert is recommended for 18 x 18 inch sham covers. It would provide a plump and full pillow from corner to corner. If your pillow cover is 20 x 20 inch, we recommend 24 x 24 inch inserts. PERFECT AFTER-SALE PROTECTION: Buy it with confidence in the quality assurance and perfect after-sale customer service team. Hippih factory have full inspections before shipment, and we promised full payment refund for any dissatisfaction. If you have any questions about this product by HIPPIH, contact us by completing and submitting the form below. If you are looking for a specif part number, please include it with your message.